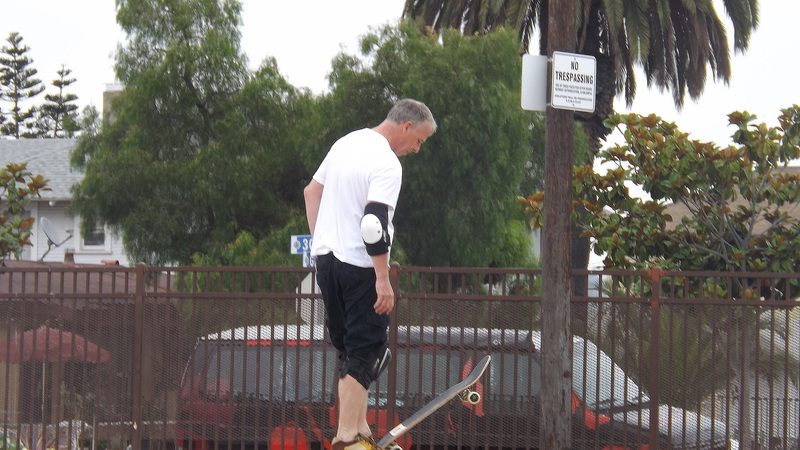 Some old bloke pausing for thought at the Memorial skatepark, San Diego. Our trusty hippy camper van in the background. 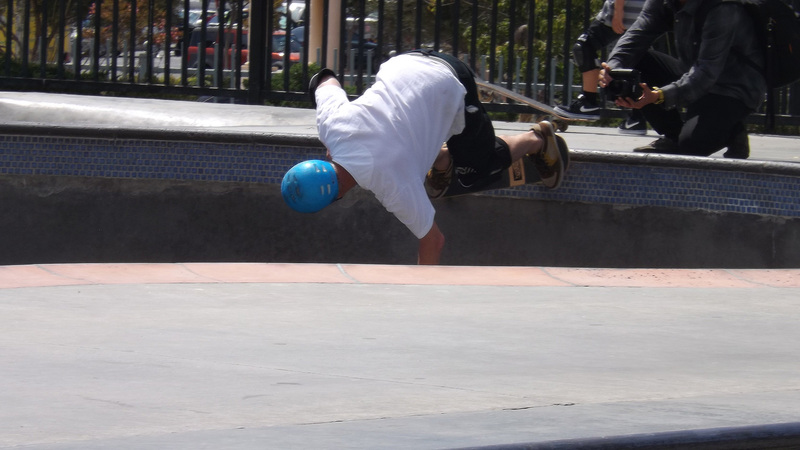 Etnies ‘skull’ pool grinded by some old bloke. 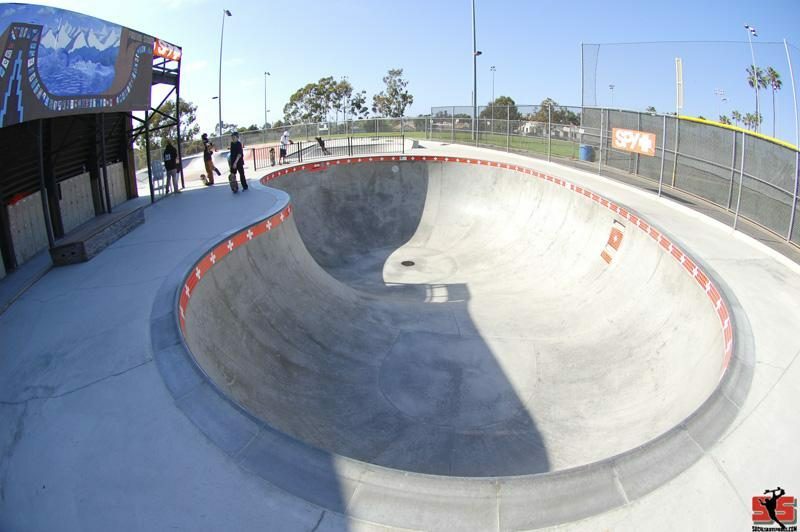 Venice beach bowl. Replica of the original ‘dogbowl’ if the rumours are true. Old bloke at Etnies in the time honoured old man stance, contemplating reasons not to tackle the scary cradle area. The Golden State held many surprises and inevitably confirmed a good deal of my long held impressions. One of my prejudices about the USA was that the nation does not brew proper beer. By this I mean that I expected my recent visit to be refreshed by the fizzy alcoholic pop such as Budweiser, Coors etc. To my delight and delectation it seems that America has had a beery revolution a couple of decades ago. 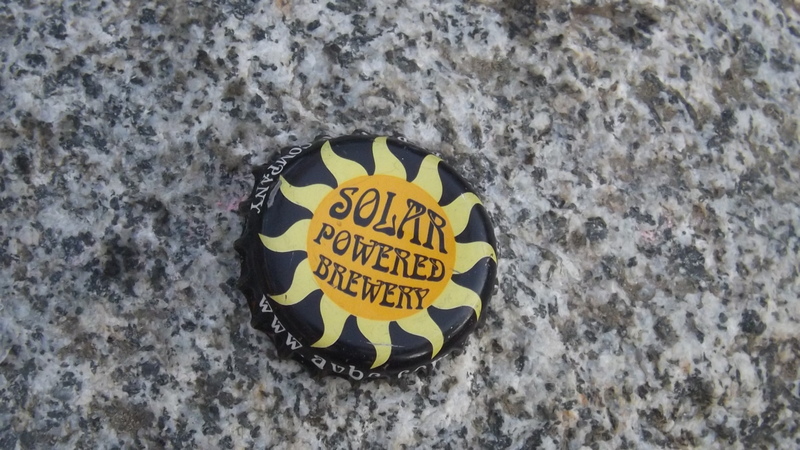 Now it is possible to find micro breweries in many towns and cities. They produce all sorts of truly delicious ales for the gourmet and gourmand alike. The India Pale Ale (IPA) is particularly fine.It is generally on the strong side but almost preternaturally tasty. At the end of each day at our camp site, after much surf/skate/tourist activity a few IPA’s hit the target with unerring accuracy. I was also welcomed with two bottles of similar ale when I got home, thoughtfully provided by Mrs Bowl Rat. I am typing this at ‘god knows what’ o’clock suffering from the ravages of jet lag on my apparently still stateside brain. The mere act has though had some effect on me…. I have paused for thought. Beer is a luxury and a pleasure best experienced on special occasions or at least occasionally. I will start to pay more heed to this truism and reap the benefits. You heard it first here. Travel refreshes the parts that beer cannot reach… to decimate that well known tagline. 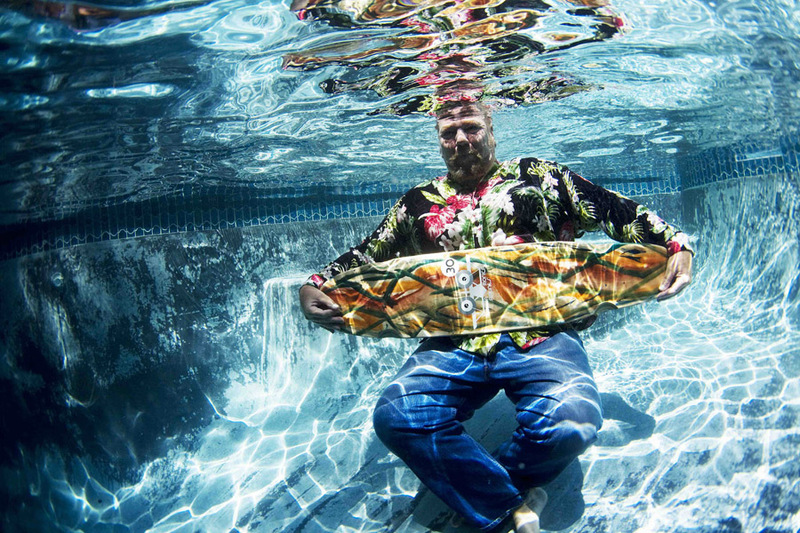 I love this photo of Skip Engblom. You can just feel the caress of the cool water with the merciless Californian sun beating down from above. I skated a few minutes at the B bowl on some new Cortech wheels this afternoon. Even the extra ‘whoosh’ that they gave me was insufficient to keep me cool. I retreated to the shade of our garden and the house. A relaxing swim in the early evening finally doused the flames. P-land was at it’s worst this evening. A close period wind swell and strong on-shore winds. Few if any waves to ride. There was a last minute ‘bruised sky’ sunset which made up for it all. I forgot to document it though, so instead this is a short vid on how to conqueror an incredibly difficult to skate pool and to have bags of fun whilst doing it. 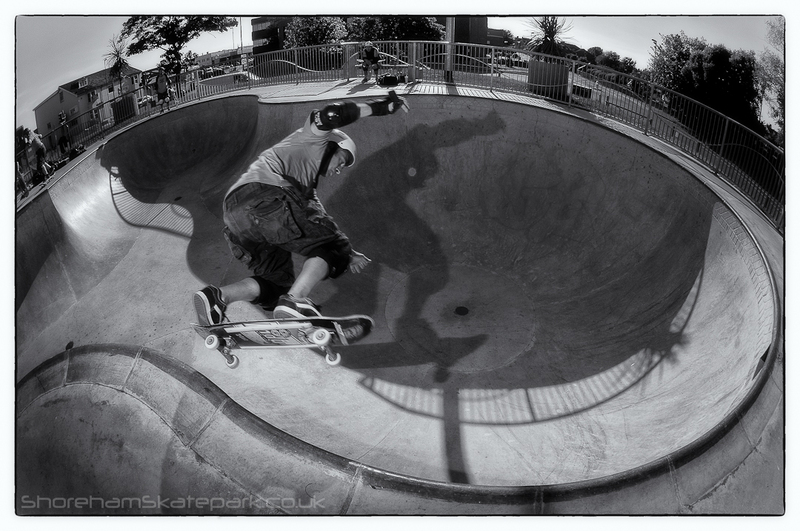 Superb picture by Jelly of Mike doing a backside ollie over the hip and on into the deep end at Shoreham. Keep it up lads! My friend Mike is a talented skater but no one could claim that he is tall. Jelly (the pictured skater) promised he would take a picture of Mike in front of the deathbox at the Shoreham bowl when he pulled off that elusive backside rock n roll. Mike wore his pointy red Protec helmet and red shorts to complete the occasion. All of the above is a lie and probably libellous. The truth is I do n’t really have a coherent explanation for this strange scene. I snapped it as it happened during our visit to the temple that is the Shoreham bowl. Four hours or more drive to the chalice of skate beneath the duggs of the South Downs took its toll on me. I started the session feeling sluggish and out of sorts. Des, Jelly and Mike all carved around the bowl grinding the hallowed coping but somehow there was a lack of momentum. An hour or two into the session I found myself installed on the bench after an unsuccessful attempt to capture the action. Then , when my camera was still in hand, I glanced vacantly across the bowl only to be presented with the sight above. I took the photo and then the scene disappeared forever more. 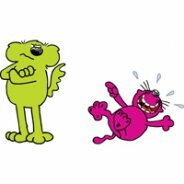 The Gnome was placed back in its polythene carrier bag and Jelly wandered back to his skateboard to wait for his chance to drop in. Des landed a big frontside huck and the session grew wings , as the drinks manufacturer says. I tried to get a quick explanation from Jelly but it made no sense. The boys went to town. Des with ever higher airs, Jelly with slides and ollies and Mike with frontside rock n rolls, the aforementioned backside rock and a perfect 3 foot above the coping fs air. Almost precisely a year ago Mike,Oakley and I visited this spot. In my write up I made a rash statement about pulling an aerial the next time I visited. Guess what folks, I actually did and multiple times too! The return of this manoeuvre after an absence of four or five years gives me a ridiculous amount of pleasure. Now the rush of yesterdays proceedings has passed I gaze at this photo with almost complete incomprehension. What the hell was he up to? All I can offer are observations on the component parts. Obviously the most important part of this picture is the railings (I despair:Ed).These fine examples of park furniture tell you so much about Shoreham skatepark and the skater framing the gnome. The railings at first sight are ordinary but take a look closer and you can see that just that little bit more effort and thought has been put into their design and installation.The rectangular section spindles below the lateral curve accentuate the wave form by being just that little bit thicker than the circular section spindles above. The thicker spindles more resilient to the knocks from bikes, skateboards etc than the lighter ones above. Function and form. The pleasing mixture of cross sections of the top and bottom rails draw the eye to the curve that ghosts around the bowl. The standards are sited on plates, levelled without packers. Some care was taken here. Jelly had a huge influence on the quality of the design and build of the best bowl in Britain. He cares. He brushes up and collects litter before and after every session. 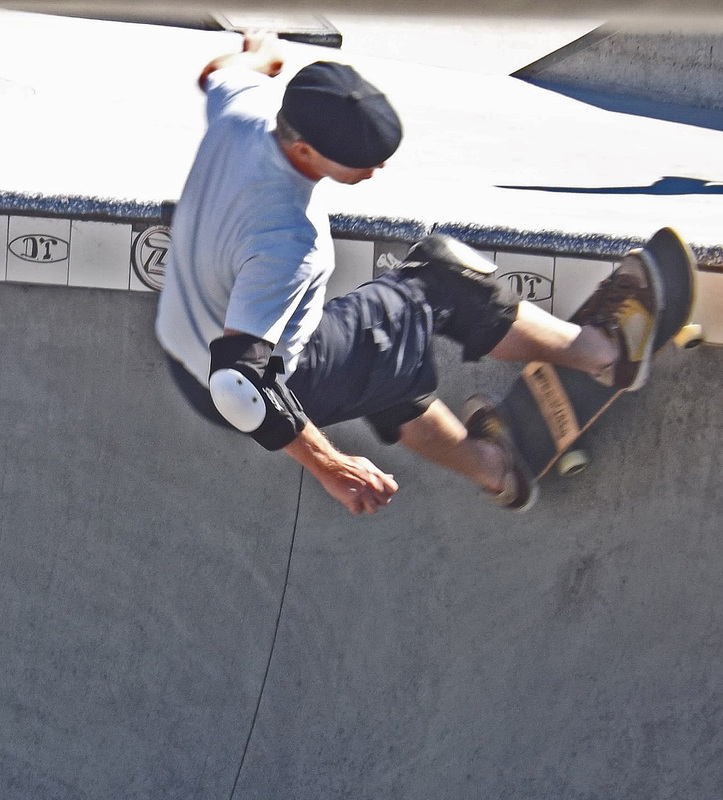 He works tirelessly on the Shoreham Skatepark group to make events happen, lighting to be installed and even palm trees to be planted (soon).Care has been extended even to the deathbox* which has been painted out to mimic a real one. He talks and joshes with the local kids. Then again, the world can see he has appalling taste in socks. It is unclear if the Gnome is a regular skater or a professional. Jelly was not going to take the chance of failing to record his visit just in case he is famous. In all the hubbub I’m unsure if it was the Gnome or Mike that pulled the Andrecht.